Let's talk about process today. Sewing, drafting, designing, writing, whatever - the process excites me as much as (if not more than) the product. Certainly there's nothing quite like the triumph of a finished product but far, far more engaging and satisfying is the process and - hidden within it - method that takes one from beginning to end along pathways of one's own making. It's not unlike a mystery or a puzzle: initially, it's an overwhelming mess of stimuli - fabric, darts, gathers, buckles, straps, eyes and ears and noses - and the knowledge that one sift through it all to find a starting point, that First Step after which momentum can take over, the What becomes Hows, the Hows reinforce the Whys and everything finds order in the ride to the finish line. Yes, it might be intimidating, but creating often is - until you find your method. And method, friends, is a glorious thing. What does that look like in the stuffed toy design process, though? I can't speak for everyone else's but I'll share mine. 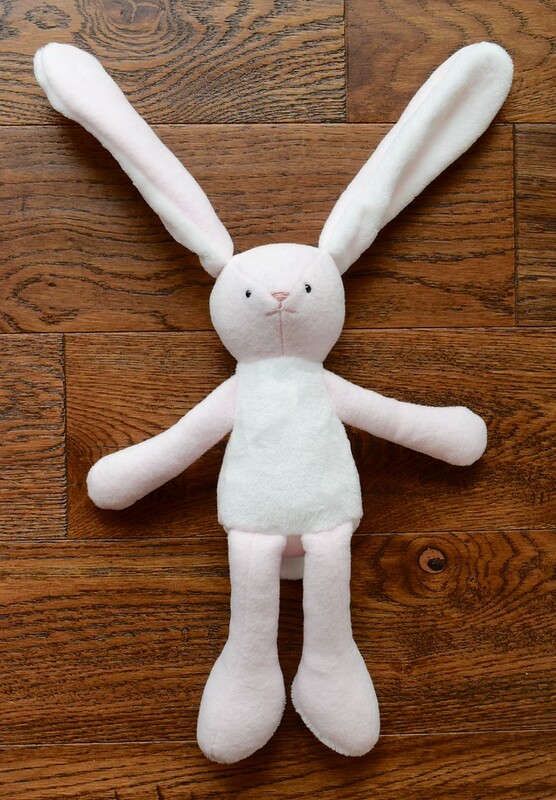 I'm going to pretend that this is a class and you want to learn how to design and draft a stuffed toy from scratch. If you remember my Make A Bag series from long ago, this might feel a little bit like it, except that we'll be deconstructing heads and bodies instead of gussets and straps. So no tutorials on how to sew a leg, or install safety eyes or attach an arm to a torso with or without a button tether. Those are techniques for sewing; we're more interested today in drafting i.e. taking a design in your head and turning it into a finished project. 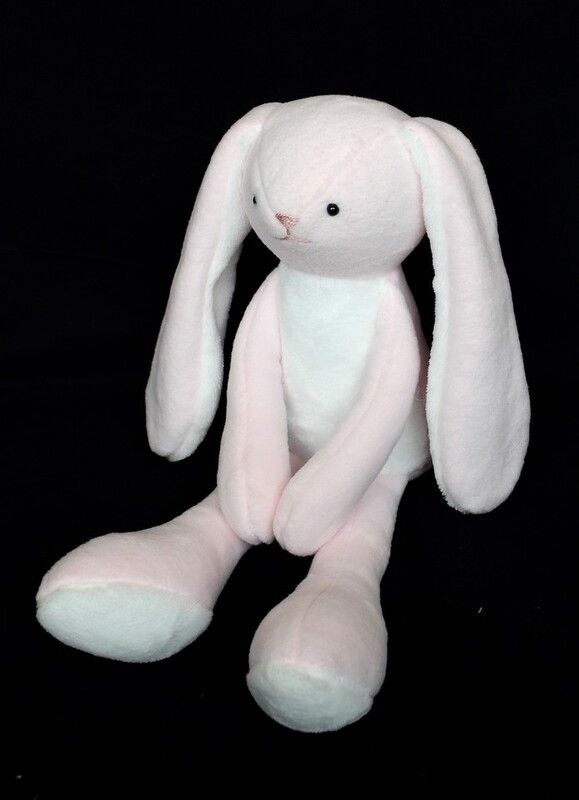 Generally, every stuffed toy begins as a concept or an idea, possibly even a motivation to hack something in a store, a catalogue, a friend's house. From that vague beginning stems the visualization of an end product, however rudimentary or fully-realized that might be. Without an end product in mind, the journey never progresses beyond that first inkling, and instead ends there, where so many other Good Intentions go to die. With an end product in mind, however, there can be Stages In-Between - that method I love so much. Let's start at the beginning, then, with that concept. 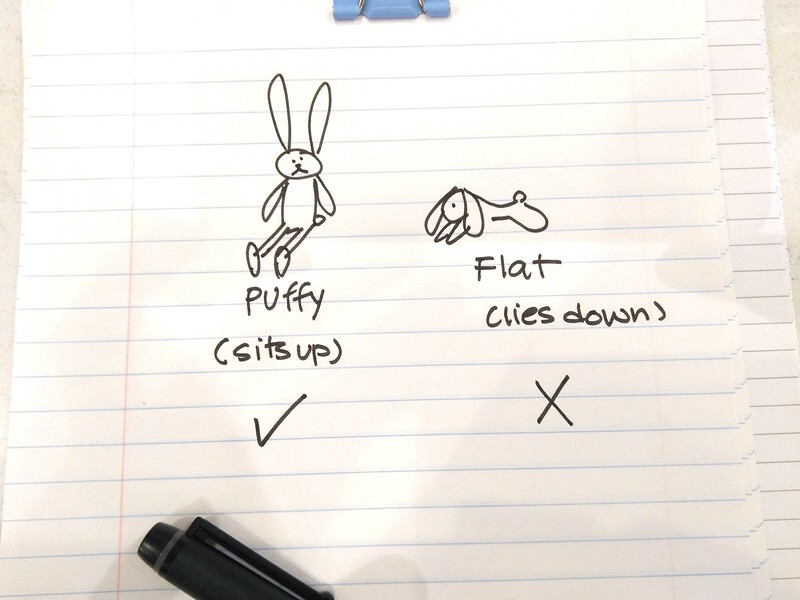 We're designing a bunny, and it's a Puffy Bunny, not a Flat Bunny. Those are Kate's terms, incidentally - and you can read about Puffy and Flat Bunnies here. The point is we want a bunny that sits upright, not one that lies on its belly. Next, we think about shapes. 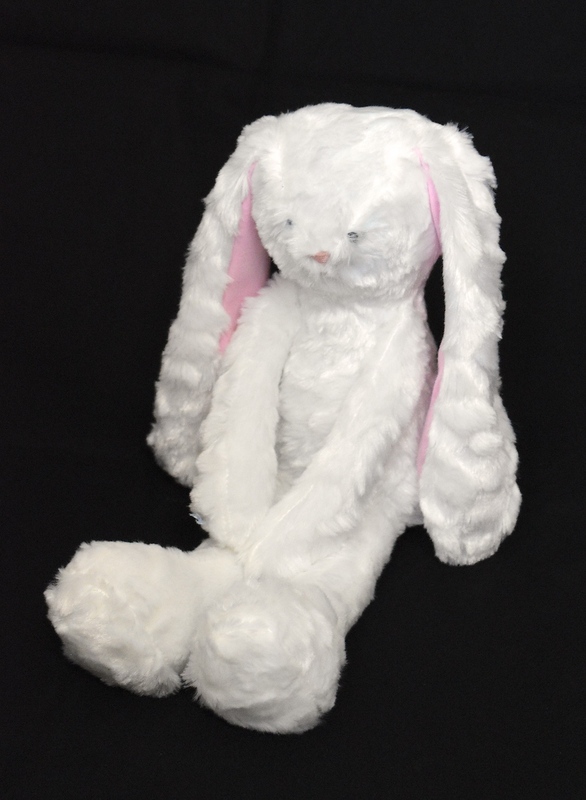 Stuffed animals come in all shapes but there are some standard base shapes from which many animals can be adapted. 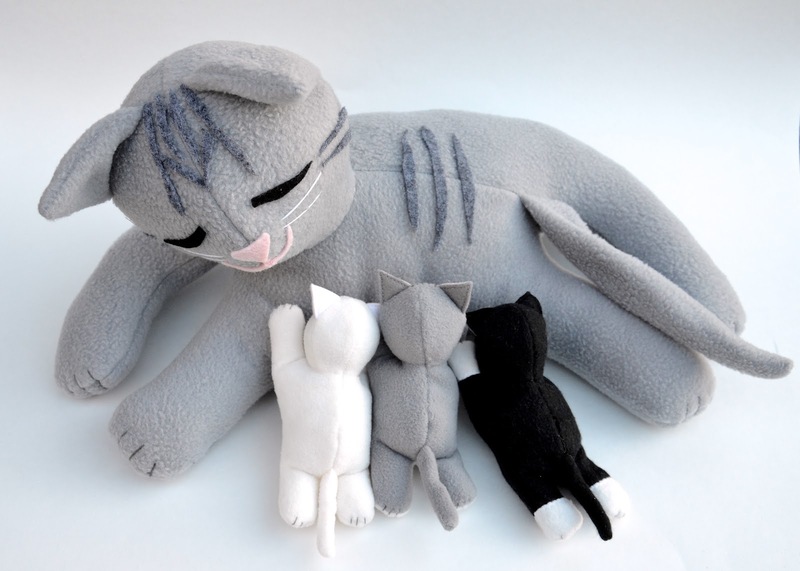 My sewing pattern Menagerie is an example of how a single base shape can be turned into many different animals by adding characteristic features. Here follow some sketches I made and photographed with my icky phone camera. 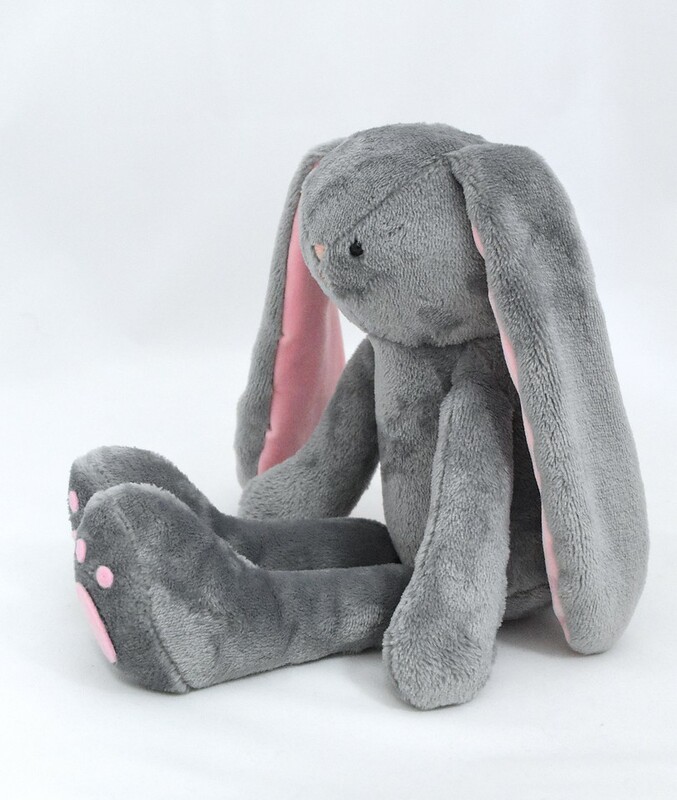 At the bottom of the stuffed toy hierarchy are flat, 2D stuffed animals. 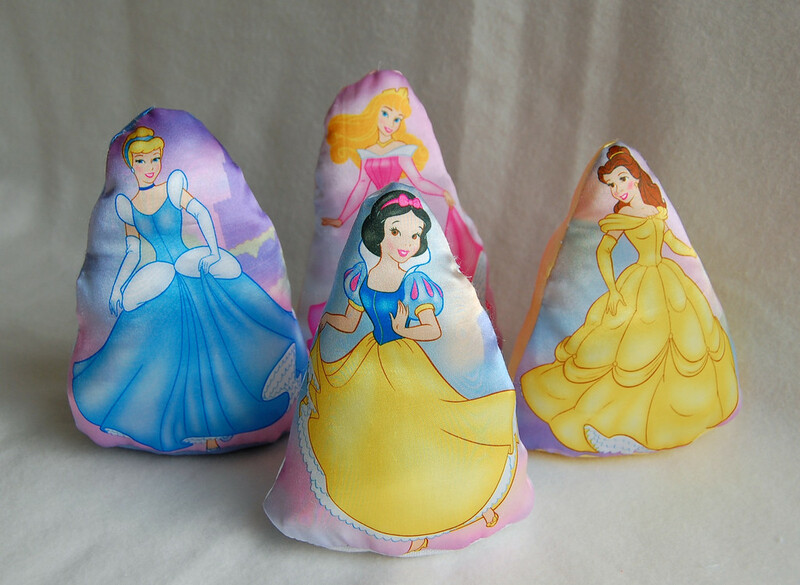 These are essentially pillows with identical front and back pieces sewn together and then stuffed. 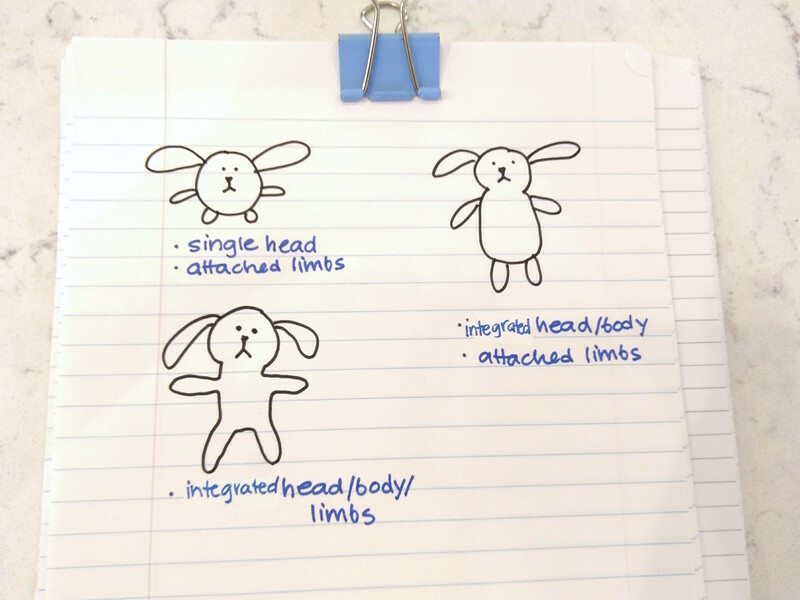 In Bunnydom, these might look like the diagrams below: single heads or heads integrated with bodies. Appendages may be part of the main amebic outline or inserted into the outline seam. 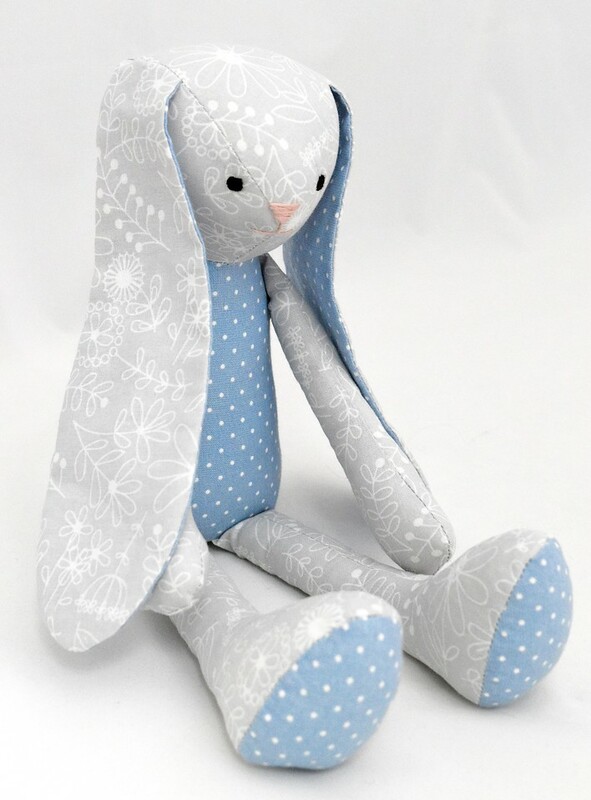 Babies' first nursery lovies - designed to be clutched 24/7 rather than posed for pretend play - are often shaped like these; this design is non-bulky and huggable like a favorite pillow. Another example: my Fairytale Dolls were based on this flat, 2D design. 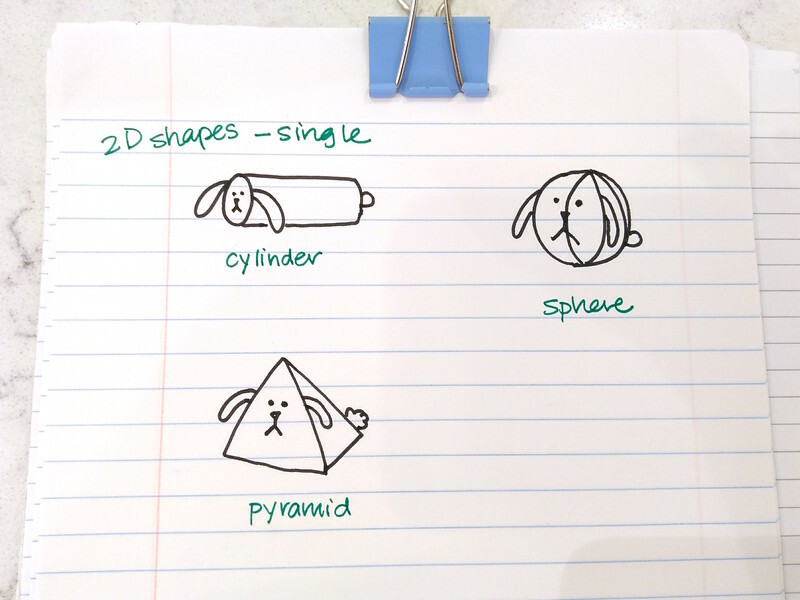 Slightly higher on the stuffed toy hierarchy are the 3D spinoffs of classic 2D geometrical shapes: circles become spheres, triangles become pyramids, rectangles become cubes and blimps and rectangular prisms. Combining shapes gives you even more options - for instance, a circle and a rectangle become a cylinder, and so on. 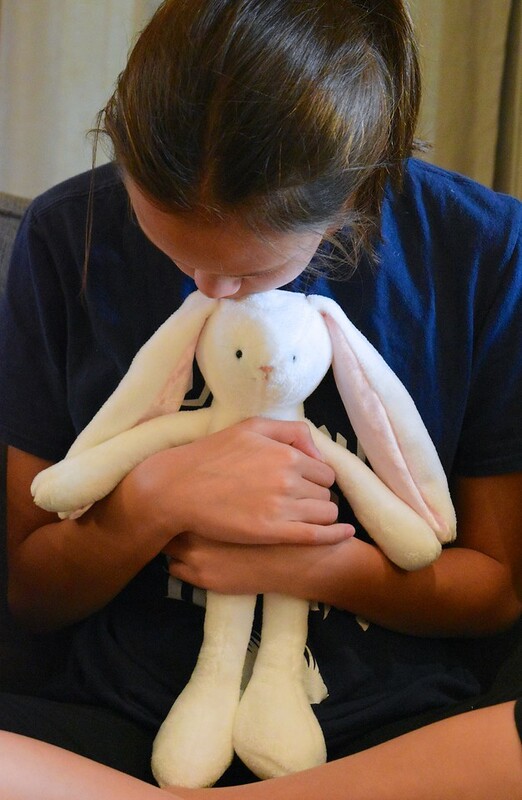 These simple 3D stuffed animals tend to be abstract and stylized rather than realistic, but they're easy to design and draft. .
To create more realistic stuffed animals, we need to branch out from classic geometrical shapes. This next sketch shows a simple technique for turning a 2D draft into a 3D one by adding a base or bottom. 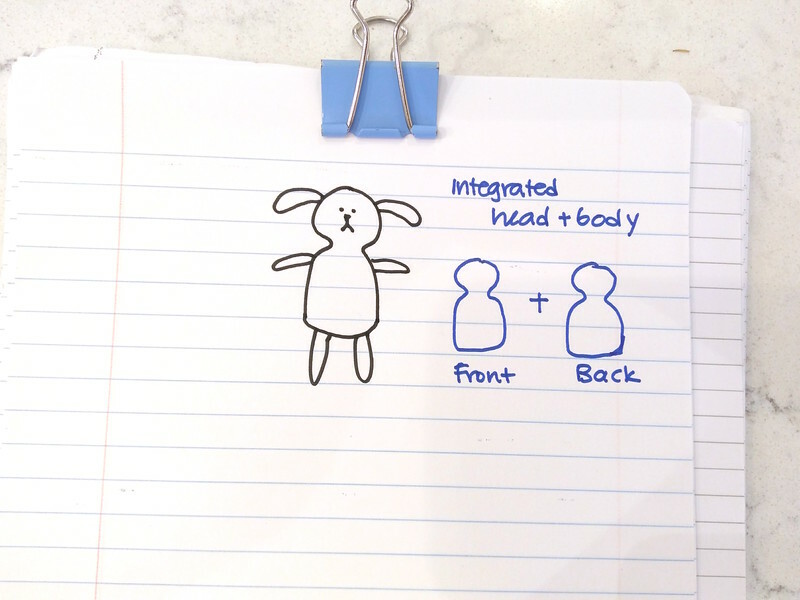 Here's a 2D bunny from the earlier sketch, whose head and body are made by sewing identical front and back pieces together around their entire outline. If we leave their bottom end open and stitch that around a separate base, the finished product can stand (or sit) upright without needing to be leaned against something. Now we know how to turn a flat toy into a one that stands on its own with some measure of stability. Booyah. Sadly, its shape is still far from exciting. So . 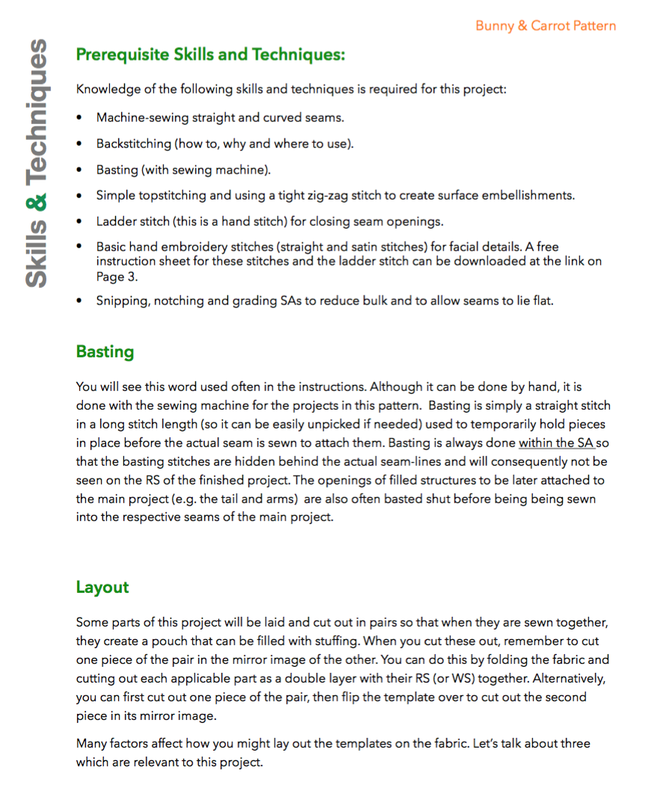 . . are you ready for some seam-shaping? 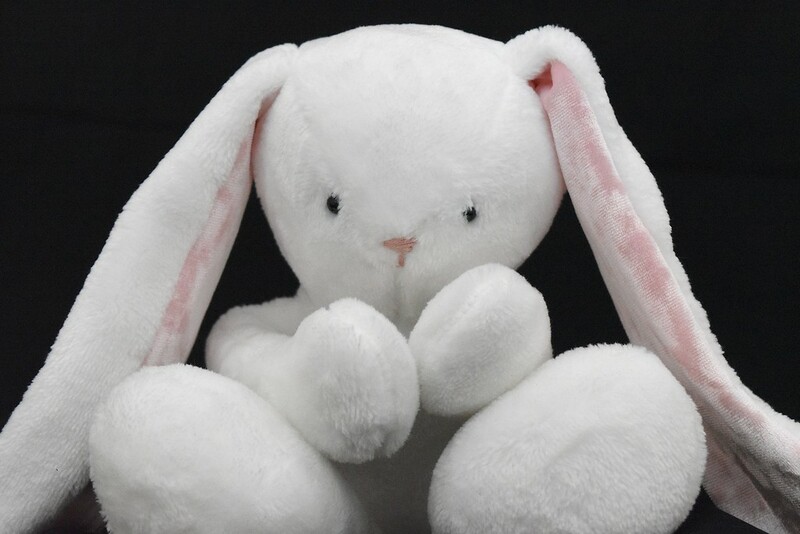 Just like garments, you can customize the contours of stuffed toys by shaping their seams. Let's illustrate that. Here's our 2D Bunny again. Even with a base, its front and back planes are uninterestingly flat and uncontoured. Let's split those front and back pieces down the middle to create a seam. Now redraw the head portion of that center seam so that it bulges out. Cut out four (2 pairs) of these new shapes, and sew each pair together along their new contoured center seam. Incidentally, instead of a seam, you can use darts to achieve an equivalent shaping effect. 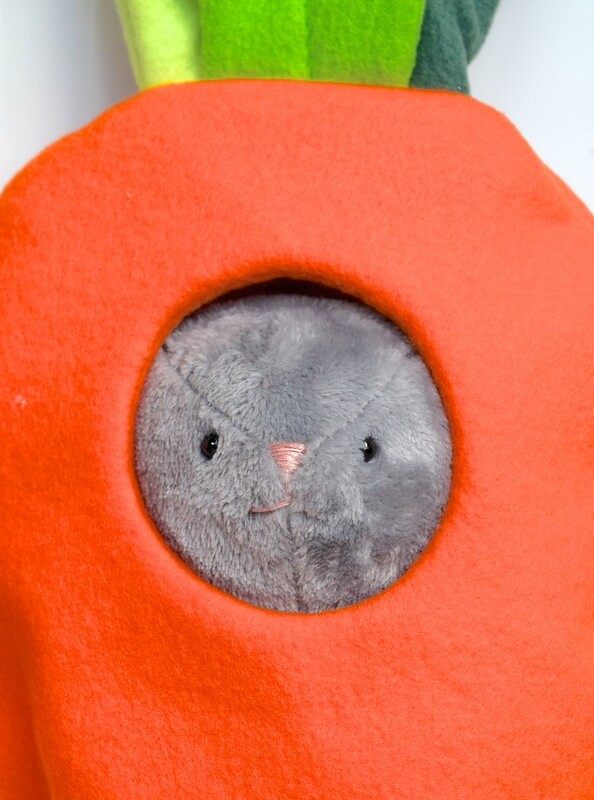 The result is a stuffed animal whose head has graduated from a flat circle to a sphere. If you also add a base, both the head and body portions will now be fully 3D. Kate's now-famous Bunny was drafted like this. One advantage is simplicity. It's a lot easier to work with a head and body that are already connected through the neck because that's one less seam to have to sew. This design is especially preferred by beginning seamstresses because it avoids the bottleneck fabric maneuvering required to secure that neck seam. 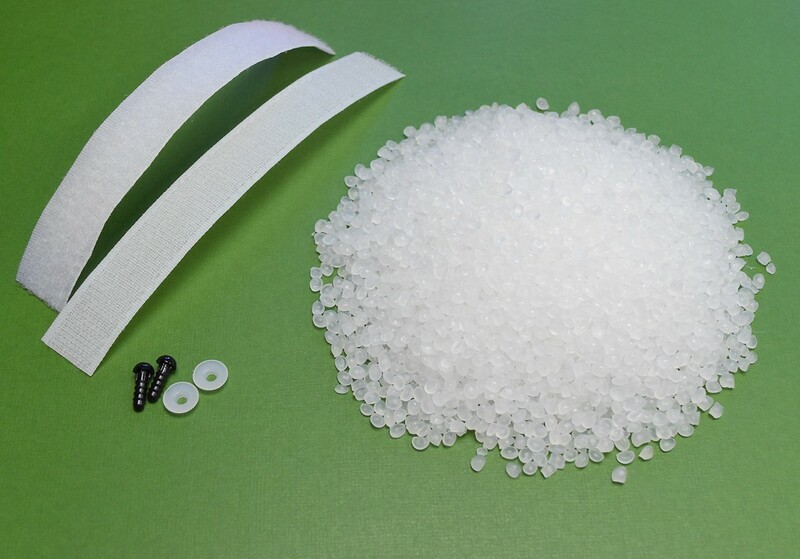 Instead, simply with suitable seam-shaping in the neck region, it is possible to get a decent head-neck-shoulder proportion that approximates the shapely effect of a neck seam. One disadvantage of this is support. Softies without an actual neck seam almost always end up with a poorly-stuffed neck region. 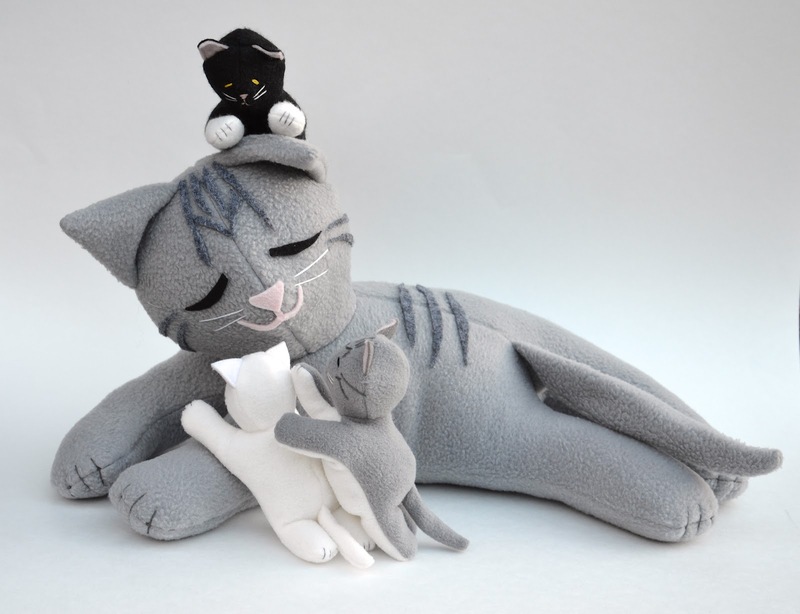 This is because the seam-less neck area is a natural fold point; even if you'd stuffed it well at the end of the sewing process, the natural head movement about the neck causes the stuffing to migrate out of the neck over time. If the fabric is stretchy, this might not be visibly apparent apart from a floppy head, but in fabrics like cotton, you might begin to notice actual unsightly neck wrinkles. 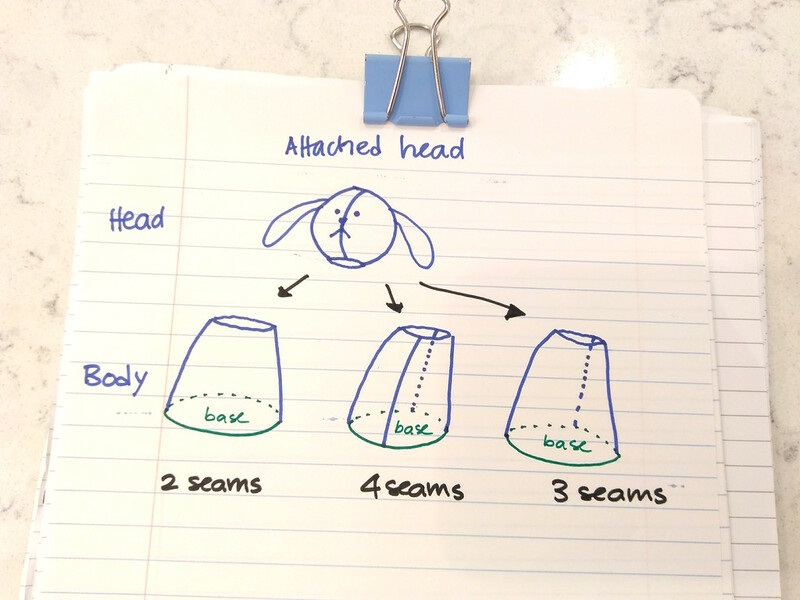 Another disadvantage is the head and body share the same seam pattern because the seam is continuous from the top of the head through the bottom of the body. This implies design limitations. 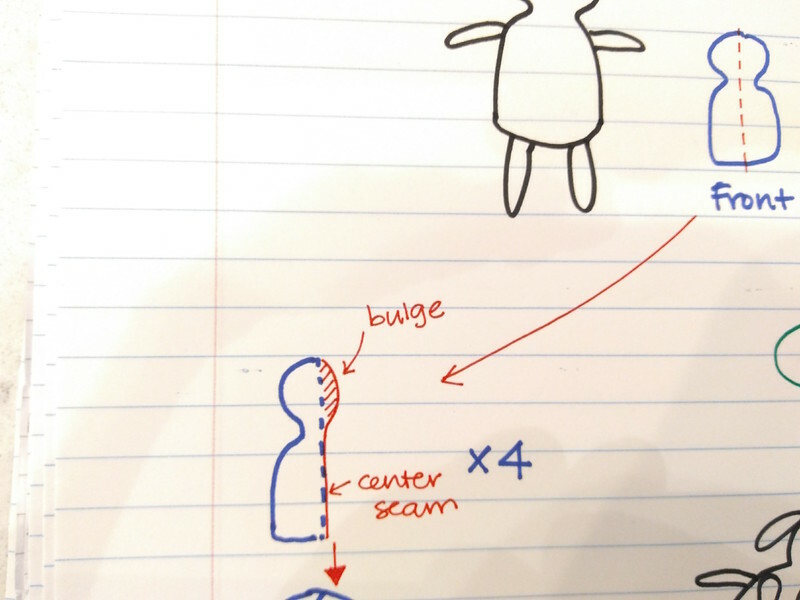 For instance, if you wanted a smooth belly without a central front body seam, you'd essentially also be committing to a flat face without contours. 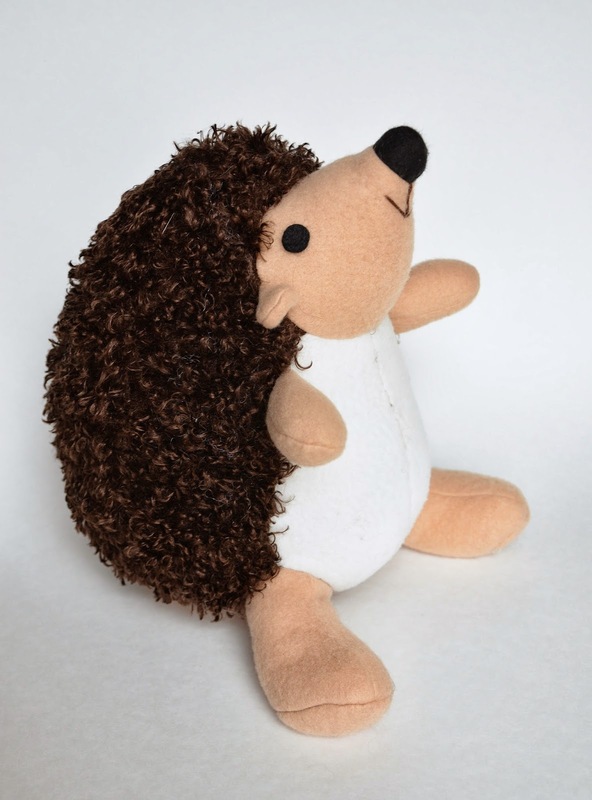 That said, the simplicity of an integrated head-and-body is often a big enough pro as to outweigh any design-restriction cons, and it remains a very popular design for stuffed animals. to . . . well, the sky's the limit, really. And here is where I will leave you today. 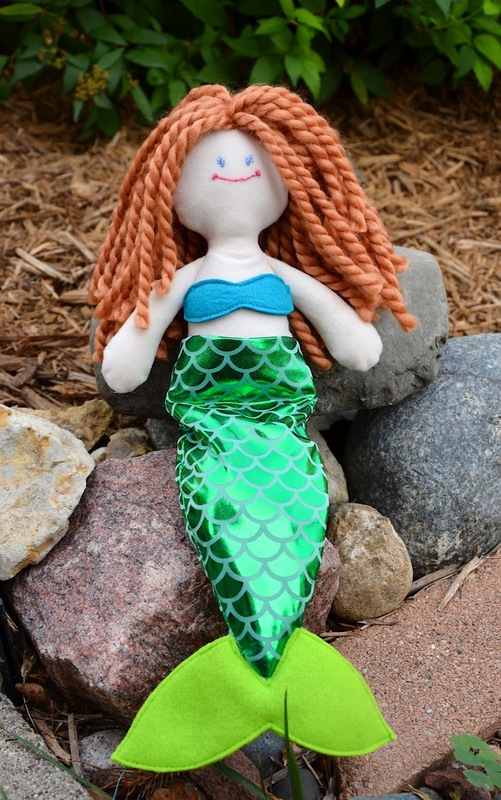 To see these concepts in action, take a closer look at the stuffed toys in your house (if your kids are anything like mine, you'll have plenty to look at!) 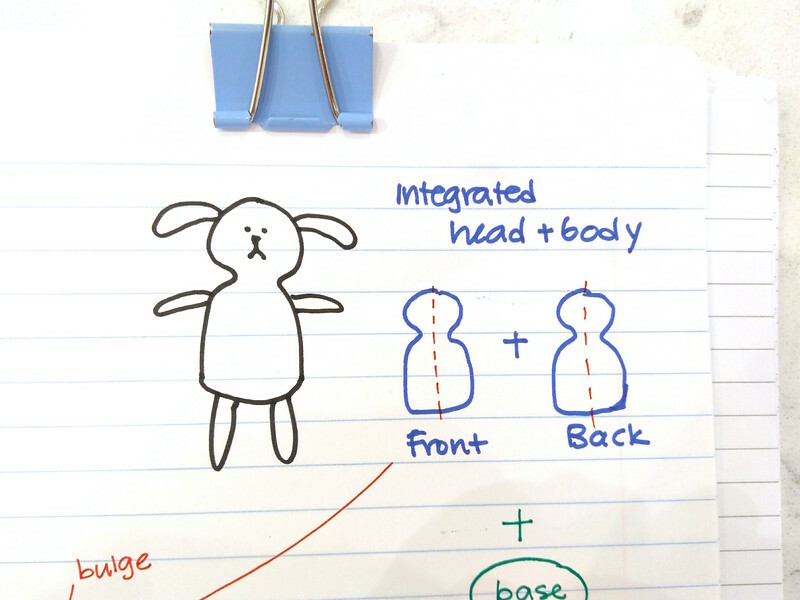 See if you can categorize them using some of the foundational principles in this post - 2D flat, 2D flat with a base, integrated head-and-body, connected head-and-body, contoured seams etc. Sometimes just being aware of how things are constructed and having a framework with which to analyze them are a sufficient first step to designing similar things on your own. Very few of us truly create out of nothing; even pure unadulterated imagination uses principles and method for a roadmap toward become a physically-realized outcome. Check back soon for the next post in which we'll talk about tweaking and refining our design! Hello friends! 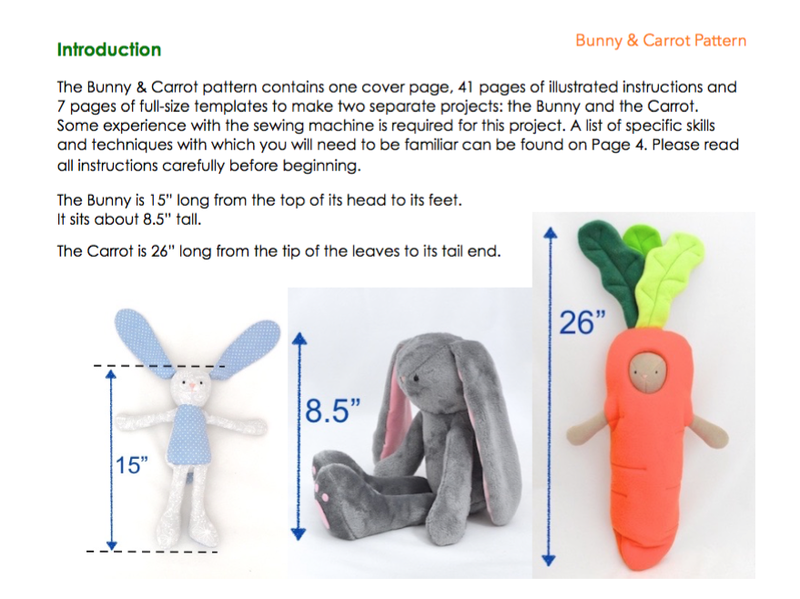 I am very excited to announce that you can now buy the Bunny & Carrot sewing pattern! Eeeeeeee! Q: How big are the Bunny and Carrot? Q: Is this made on the sewing machine or by hand? 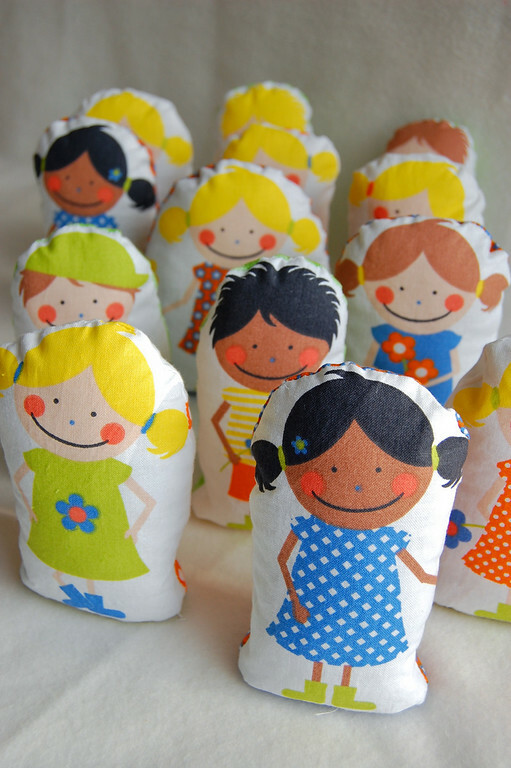 A: The projects in this pattern are intended to be made with a sewing machine. Q: What sort of skill level is this pattern suitable for? 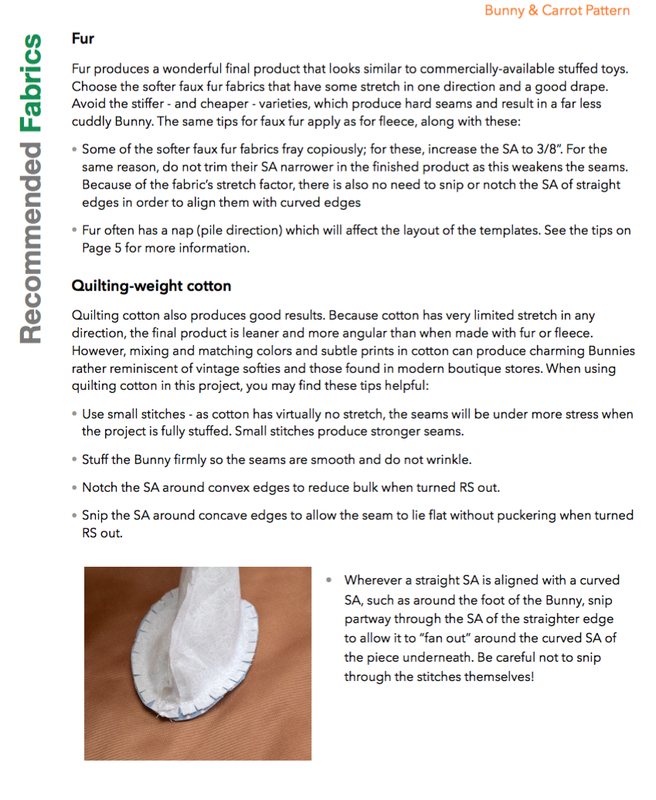 A: This is the recommendation from my pattern testers: a seamstress of intermediate sewing level or even an advanced beginner should be comfortable with it (also adventurous beginners who like a challenge). Here is a list of skills you will need. Q: Are there photos or is it just text instructions? Q: Will I need to enlarge the templates? 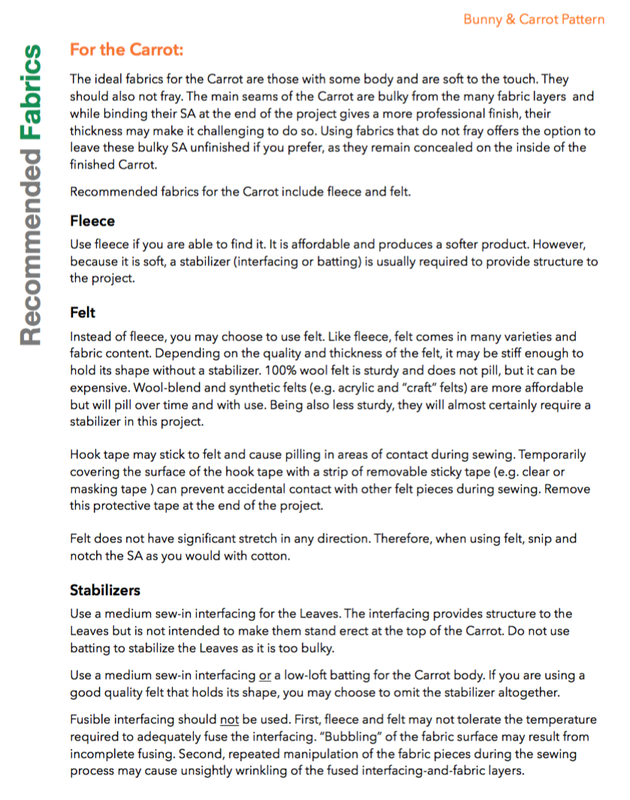 A: There are 7 pages of full-size templates - no enlargement needed. 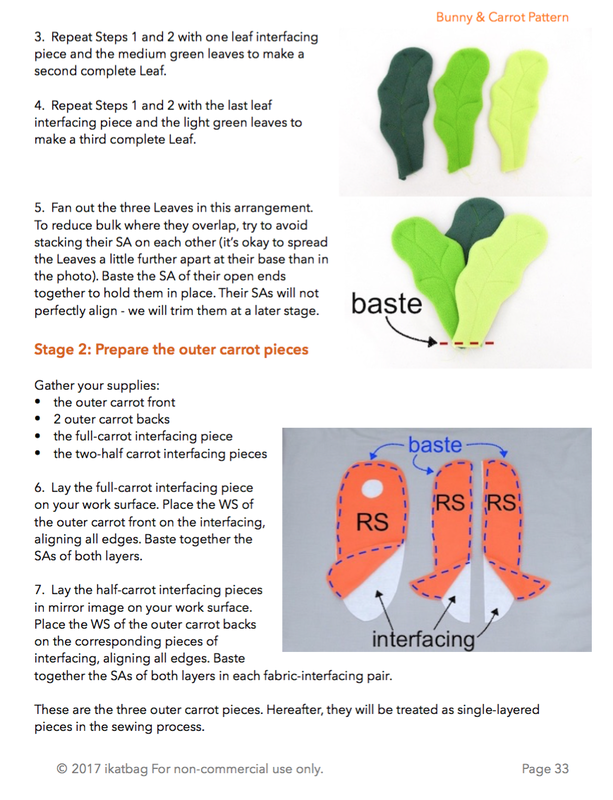 Because of its size, the Carrot template will be printed out as partial templates and will require some simple assembly with glue or tape. 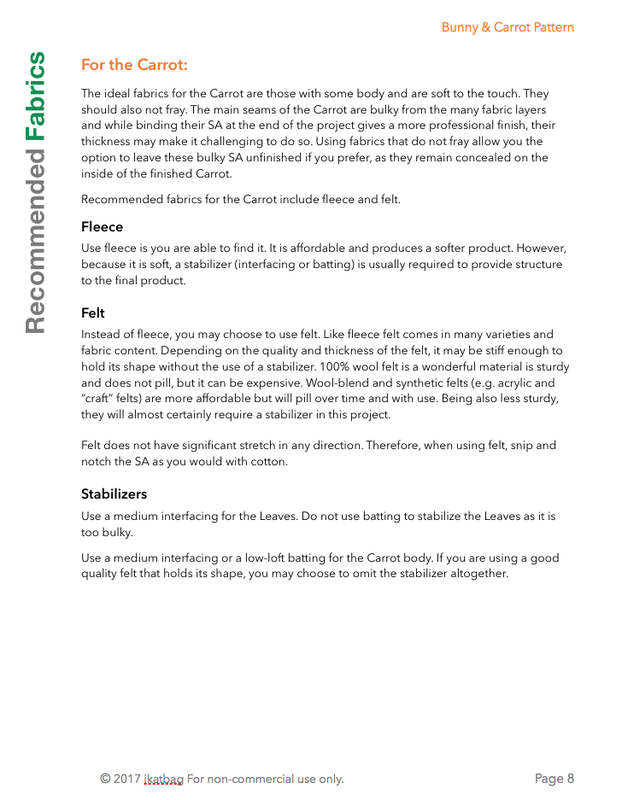 Q: What fabrics should I use? 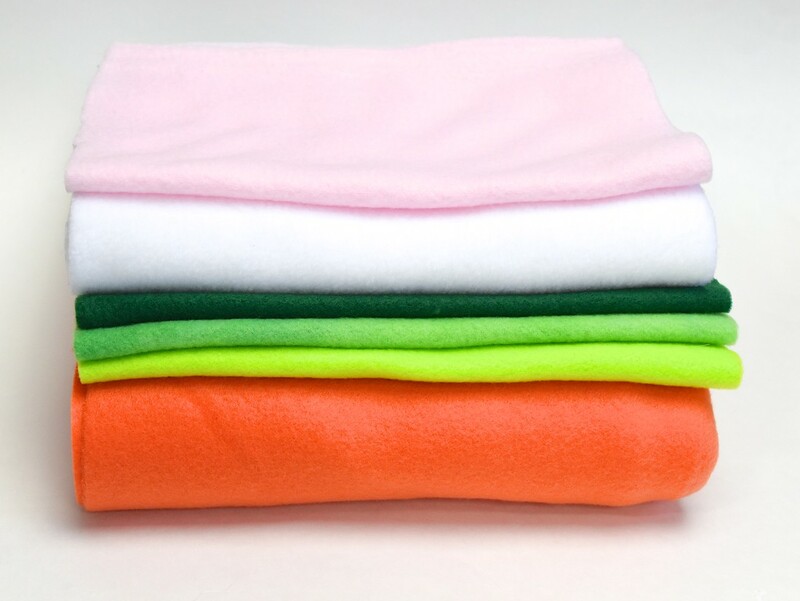 A: Fleece is ideal for both the Bunny and Carrot. 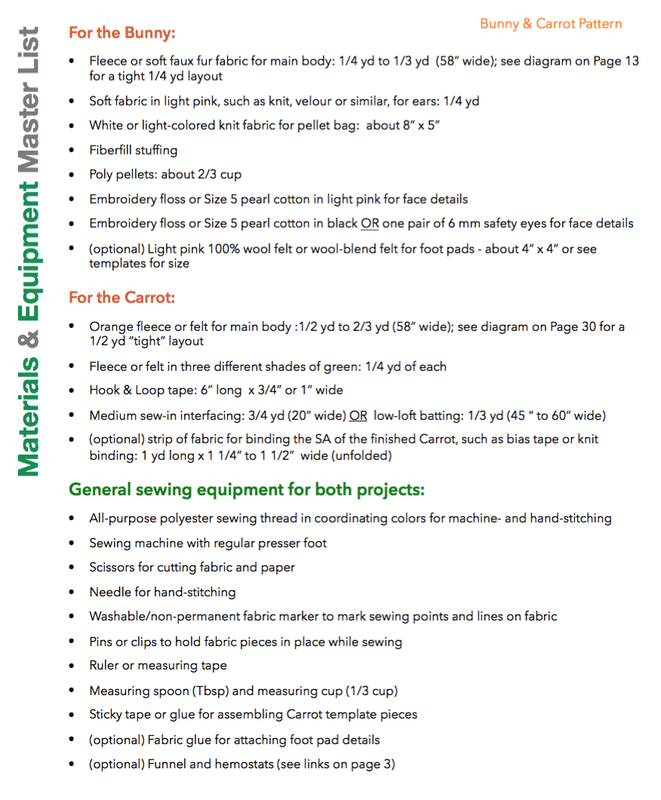 Here is the master materials list. 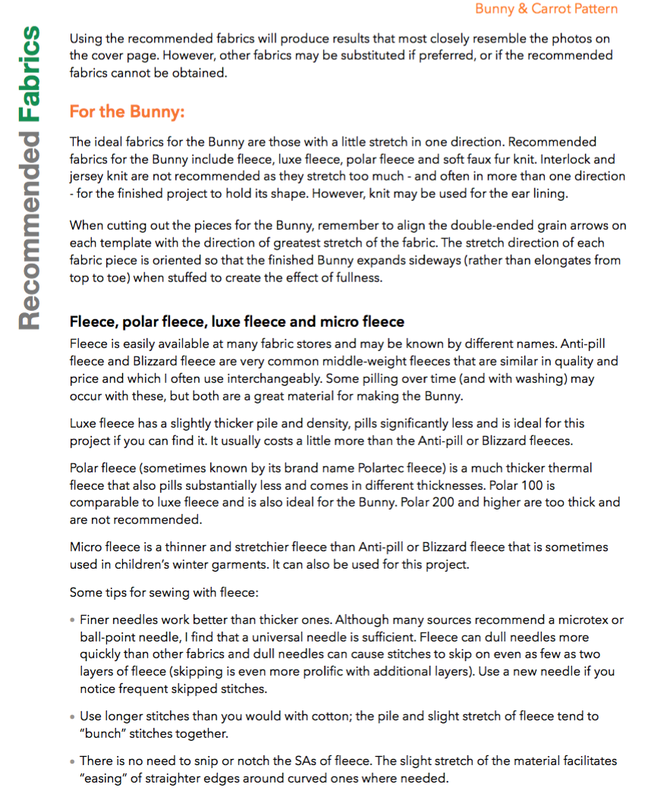 Below are more pages detailing recommended fabrics for the Bunny, offering other options should you choose to diversify from fleece. Q: Where can I buy these fabrics? 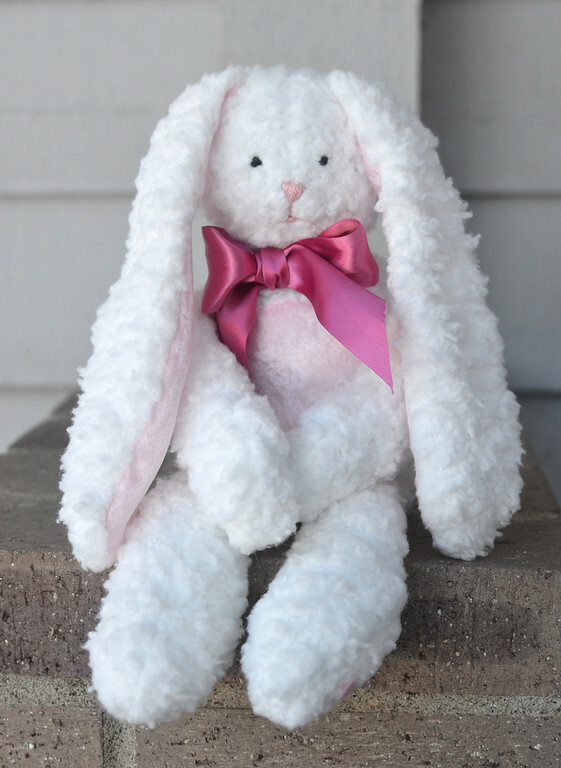 Q: What is the cost of the Bunny & Carrot Pattern? 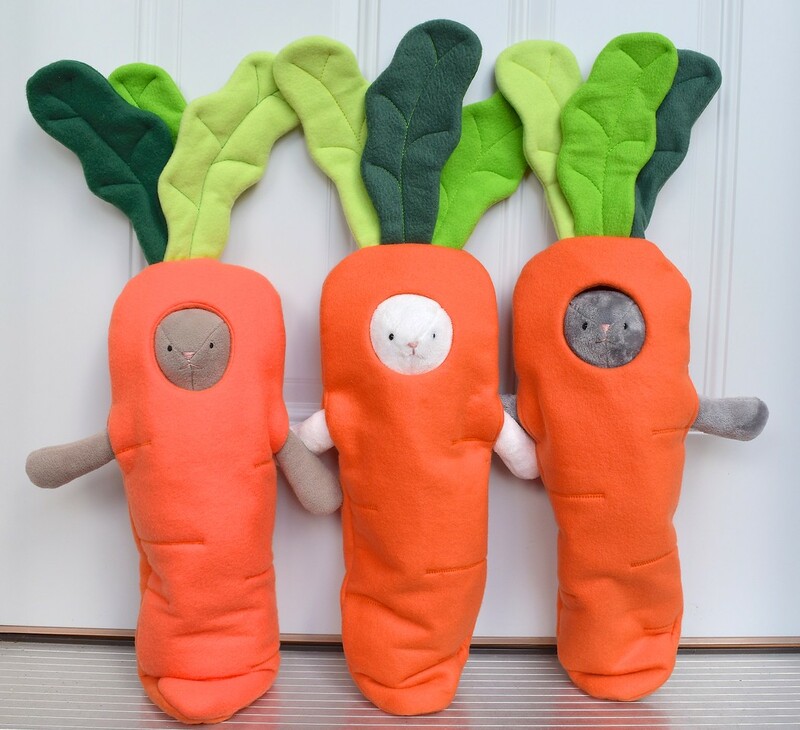 If you love bunnies but don't (or don't want to) sew, I will also have three bunny-and-carrot sets in the shop soon! 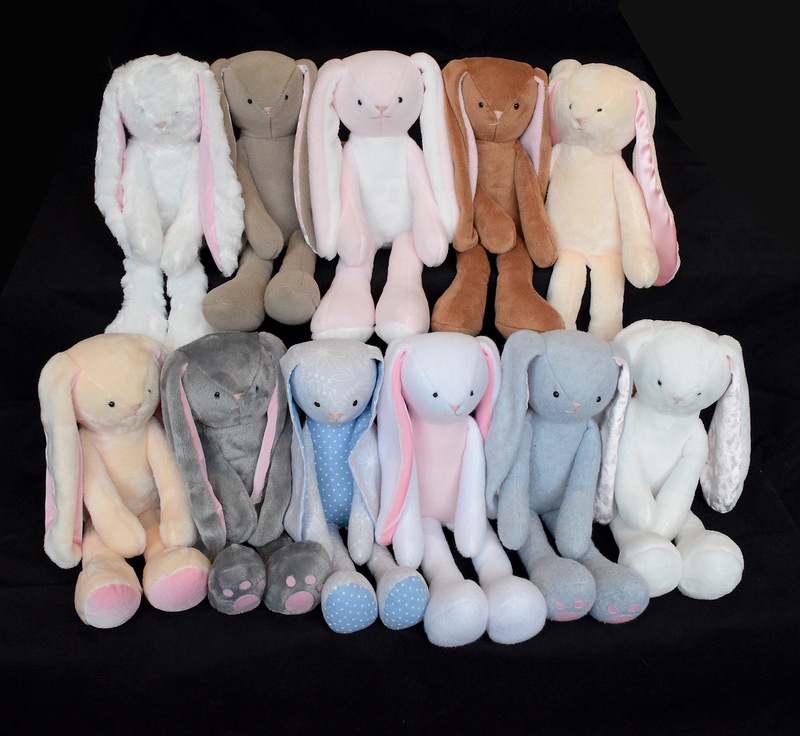 Some are samples from the pattern design process, and some I made just because sewing bunnies is ridiculously addictive and I can't seem to stop. 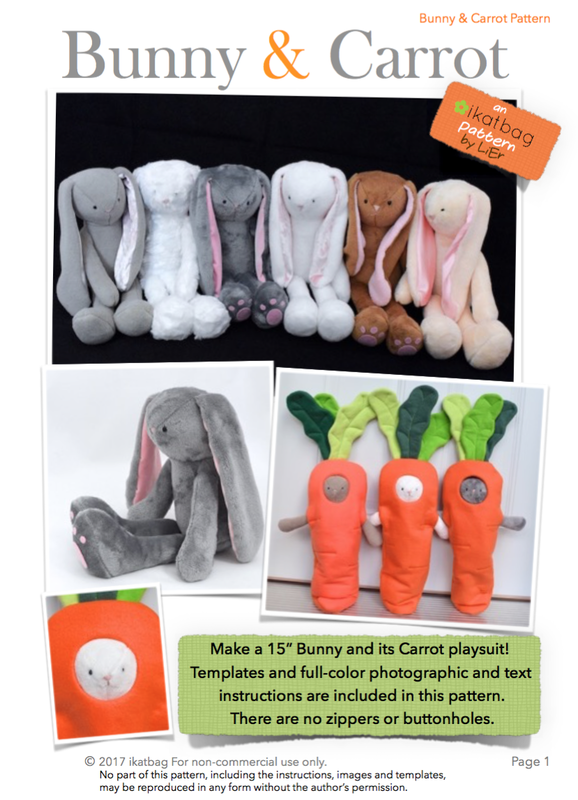 I am grateful for my six testers - Cecile, Barbara, Heather, Melissa, Donna and Louise, and my proof reader Grandma G. They were wonderful to work with, and I loved seeing their creativity in their bunnies and carrots! 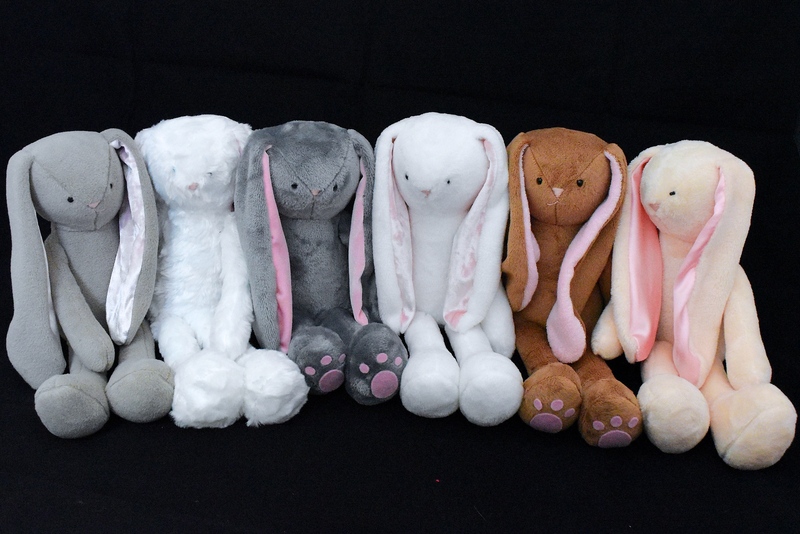 They represent a wide spectrum of sewing experiences, backgrounds and personalities and their feedback was instrumental in the evolution of that first alpha draft into the version you guys will be using to make your own Bunnies and Carrots. Thanks, you guys! I'll be sending you a copy of the final version of the pattern this week! 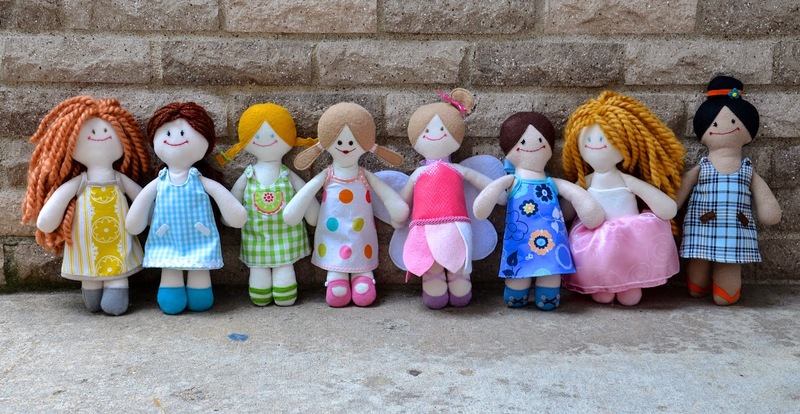 To the readers who responded to my call for alpha-testers but whom I was unable to include in the testing team, I will send you the 50% discount code this week, too, so wait till you receive my email to buy your pattern, okay? 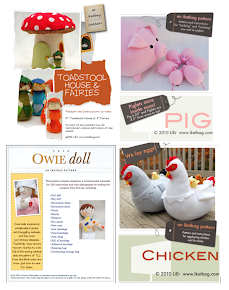 To my readers who hail from EU countries: the best way to buy a pdf pattern is probably via my etsy store. I've heard that the paypal-E-junkie interface may be funky for EU transactions, possibly because of the VATMOSS thing. 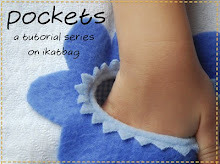 At the end of this post are instructions on how to buy my patterns via etsy. And finally, thank you, all my lovely readers, for your enthusiasm and tenacity! 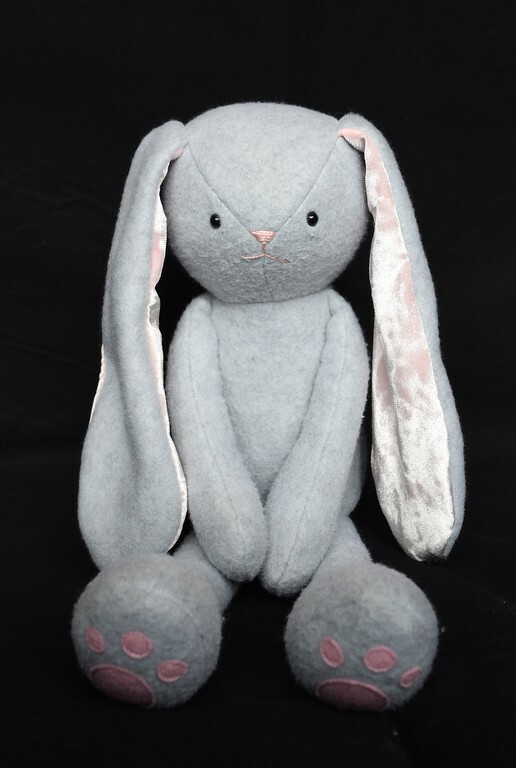 This pattern is the result of your interest in (and requests for) an ikatbag bunny pattern and I hope you enjoy making many bunnies and creating many happy memories with your children, grandchildren, nieces, nephews and young friends. Kate and I are thrilled to finally share this pattern with you. 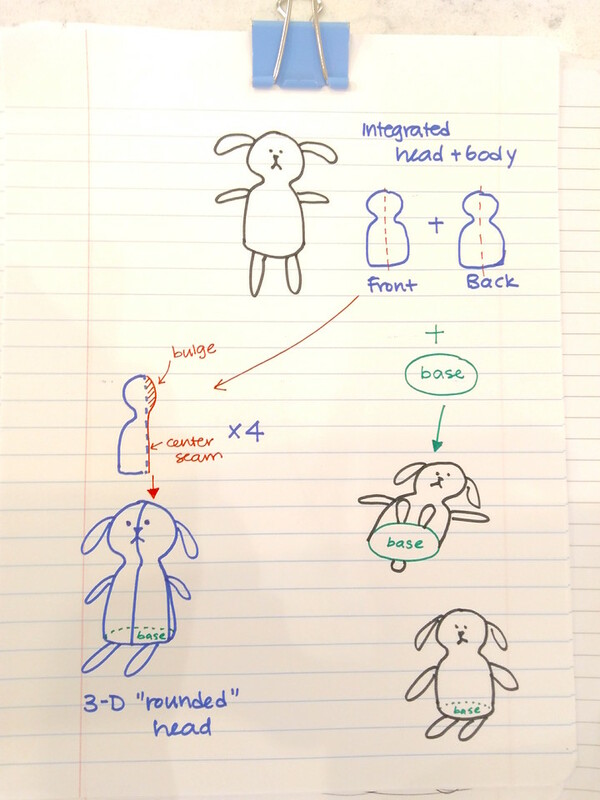 Looking ahead, I thought you might be interested in seeing the evolution of a stuffed toy design, from concept to finished product. It's not that different from drafting garments, except that it's 3-D and fit issues look very different in a toy than a dress or skirt! 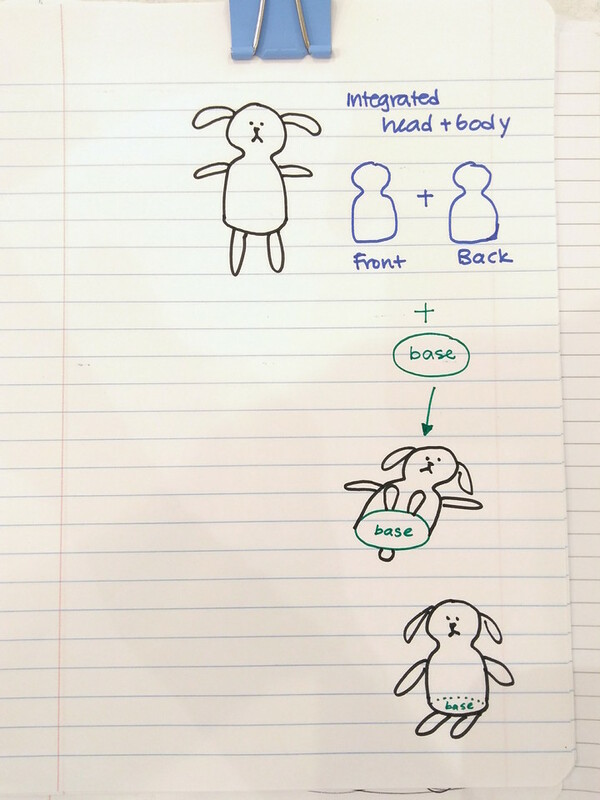 In the coming days, look out for a couple of follow-up posts on the Bunny and Carrot pattern and designing soft toys in general. I'm excited to share the method to my madness! 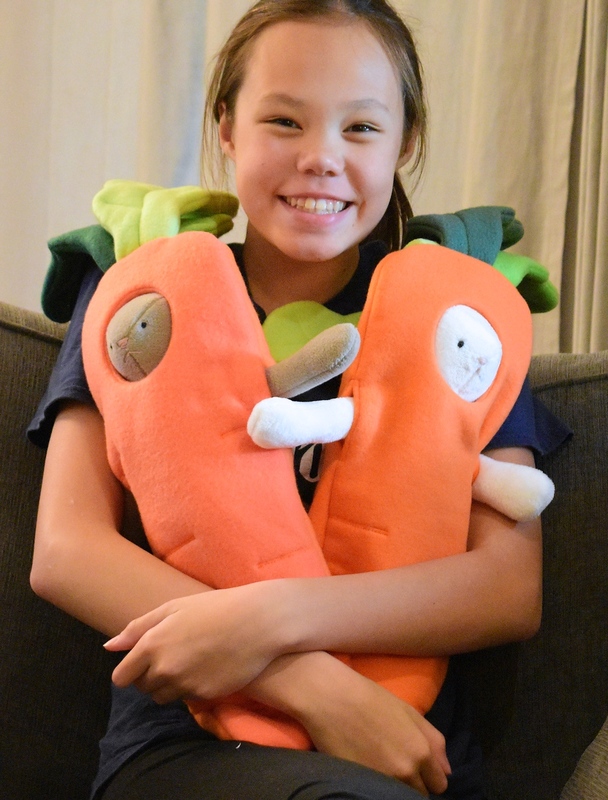 Q: So how do we buy the Bunny & Carrot Pattern? A: Buyers from countries in the EU: email me directly (my email address is in the sidebar of my blog) and I will set up a reserved listing for you in my etsy store. You can pay by paypal or credit card and I will email you the pattern file as an attachment once the payment has been processed. It's fast and easy. 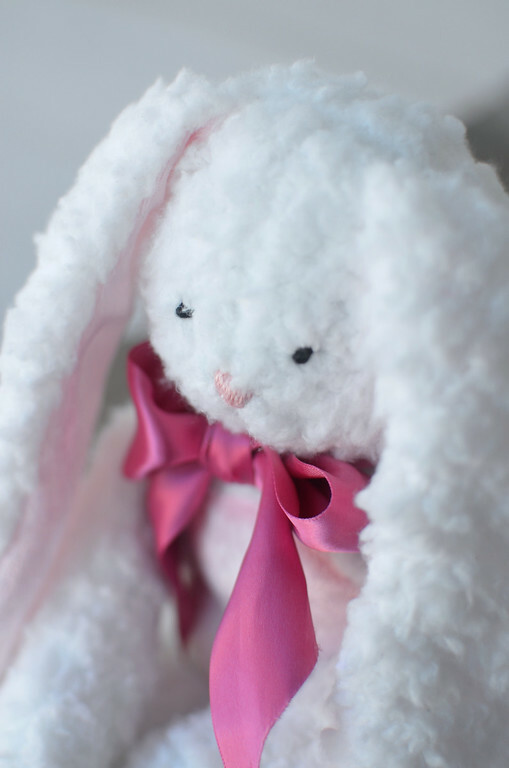 All other buyers: go here to buy the Bunny & Carrot Pattern.